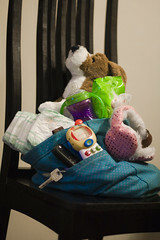 One of the top items on many new parents’ to-buy list is a nappy bag. It can shine like a beacon of hope against the fear that having a baby will mean you can never leave the house again. With a nappy bag you can hit the streets, hit the road, hit the town! Most people with whom I’ve worked nappy bags three or four times the size of their baby and filled to the brim. I’ve already written about paring down your nappy bag so you don’t carry around more than you need. If you lessen the amount of stuff you bring with you on baby outings, then do you still need an expensive and large specialised nappy bag or just….you know… a bag? 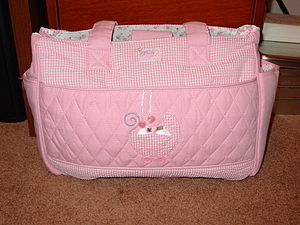 What makes a actual ‘nappy bag’ different from a regular bag? Ever seen one of those nappy bags that looks like it’s holding the necessities for an entire childcare centre? What about a parent without a nappy bag, desperately trying to calm a child bleating for food or needing a change? It can seem so hard to get the balance right. I hate carrying around a giant bag supplied with enough nappies to last a week and fourteen changes of clothes. But, I’ve also gone out with a carefree swagger, only to end up tearing my hair out later when all the pram yields is a few dried out baby wipes and an already dirty bib. And know where and how to buy the essentials if caught out.